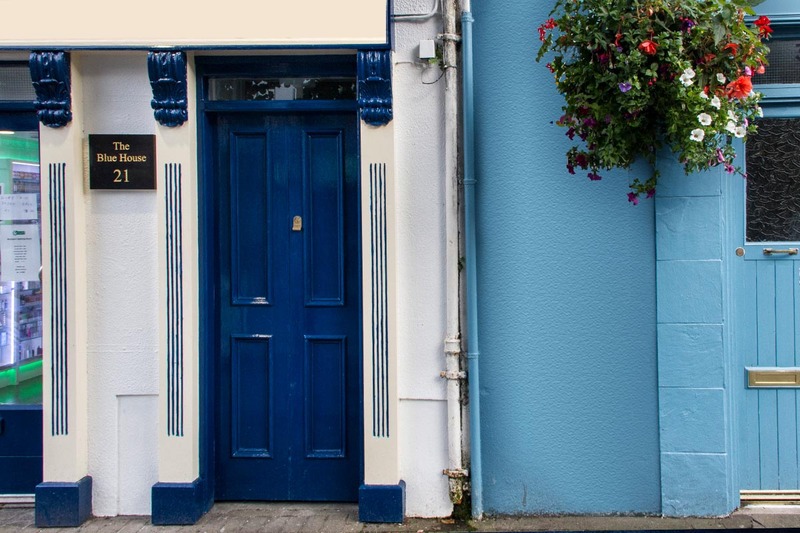 The Blue House is your luxury self catering accommodation in the centre of Westport town, County Mayo, in the West of Ireland. This unique townhouse derives its name from the blue wooden doors on Bridge Street. It has a modern fully equipped kitchen/dining room, living room with open fire, three bedrooms, two shower rooms, two outdoor spaces. The guest house is decorated with highest quality furniture after its recent renovation. Your perfect location for family or a group of friends - to enjoy all that Westport has to offer. Wonderful house, great amenities, fantastic location and brilliant host. Best place to stay in Westport! This was our second trip to Westport so we are not strangers to the area. This time we stayed at the Blue House and it did not disappoint. It is a tiny slice of elegance on a street beaming with life. The Blue House was an outstanding property and experience. So many beautiful and personal touches. Chocolates in the bedrooms, eggs and milk in fridge, logs ready for the ﬁre. Rachel truly makes you feel like family.